GLENDALE — One person was transported to the hospital after a fight broke out at Great Skate in Glendale early Sunday morning, police say. 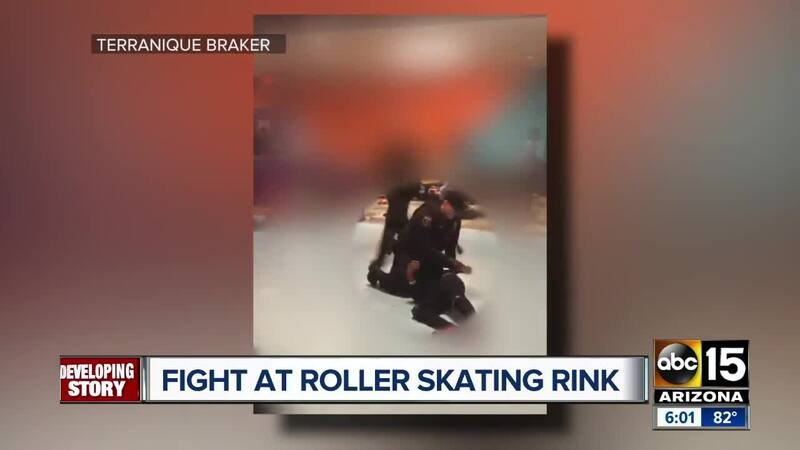 According to Glendale police, they responded to "multiple subjects involved in a physical altercation" at the indoor roller skating park. Officers provided a call log of the incident Monday afternoon. The log indicates approximately 27 officers responded to the scene to address the various groups moving around the area. Police say multiple marked cars were intentionally damaged as well as a personally owned vehicle of one of the officers that was working off duty at the skate park. The person taken to the hospital sustained non-life threatening injuries. No arrests were made, and there are no outstanding suspects at this time, authorities say. Glendale police say the have not received any complaints from the community regarding the tactics or performance of their officers that night. "We would like to thank the community for its outpouring of support. Many of you may have seen the news reports of the incident that took place during our All Night event at Great Skate this past weekend and we feel compelled to share some information about the nights events. Our All Night events are meant to give our local teenagers a place to go to recreate and have fun in a CLEAN, FUN, FRIENDLY and SAFE environment. These All Night Skates are special events, we host about 8 per year. This past Saturday night, we had a handful of troublemakers show up at our facility who clearly came with motives much different than ours. These few teens not only disrespected other teens in the building but also police officers, security and our staff. Quite frankly, we were appalled at this small groups behavior. Most of the teens who came that evening have been attending our events for years and are good kids who come to ROLLER SKATE and enjoy a night out with their friends. The behavior of the few troublemakers this past Saturday night are not reflective of the usual crowd that we have at Great Skate. We extend our deepest apologies for the behavior of the teenagers that attended that acted disrespectfully and in some cases violently towards our other valued guests and staff. We extend an extra special apology and thank you to the Glendale Police Officers who had to assist us that evening. We are endlessly thankful for their presence. We are working closely with authorities to arrest those involved and plan on cooperating in whatever way we can. Any teen that took part in the incident Saturday night has been banned from Great Skate permanently and we will continue to enforce this policy in the future. We have a beautiful skating facility that has served this community for many, many years. We hope that you will see this terrible incident for what it was, and hope to see many familiar faces at our spring break sessions and beyond. Thank you again to so many of you who have reached out with kind words."